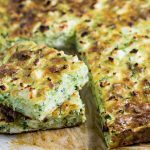 Our Keto Zucchini Slice is a popular lunchbox classic where we’ve cut the carbs! This slice is an ideal lunch or snack that everyone loves. Place the butter, onion, and garlic in a small saucepan and saute over medium heat, until the onion is translucent. Grate the zucchini coarsely, place into a clean towel or muslin cloth and squeeze out as much liquid as you can. In a large bowl add the zucchini, onion mixture, spinach, cheddar cheese, half the feta cheese, almond flour, baking powder, salt, and pepper. Mix well. Add the eggs and cream and mix well. Prepare an 8x12 inch baking dish by lining it with parchment. Pour the zucchini mixture into the baking dish and smooth out. Sprinkle over the remaining feta cheese. Bake in the oven for 25-35 minutes, until golden brown and an inserted skewer, comes out clean. Allow to cool for 15 minutes before cutting into portions and enjoying.